Creating our kitchen was very pivotal for us and finding just the right craftsman for the job became our goal. 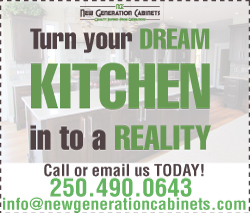 When we found Daniel, owner of New Generation Cabinets in Penticton, we knew we had found a true craftsman in the art of cabinetry making. From conception to installation our experience has been wonderful. Daniel is so full of creative ideas! He blended his knowledge and expertise with our vision to create a kitchen that is truly a reflection of our lifestyle and personalities. Daniel and his team of craftsmen are true professionals. Their superb work ethics and willingness to make every detail right is a breath of fresh air. Thanks Daniel for making our dream kitchen a reality!